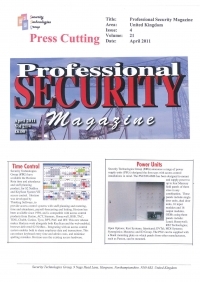 Reprint of article announcing the launch of Security Technologies Group's Proximity Request-To-Exit switches. 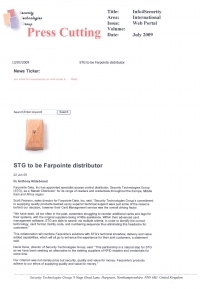 Reprint of an article announcing the launch of the New STG Web Site. 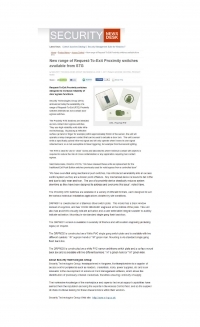 Click on the image on the right to download this Press Cutting. 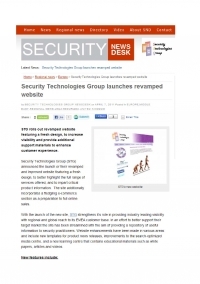 Reprint of article announcing the launch of Security Technologies Group's revamped Web site. 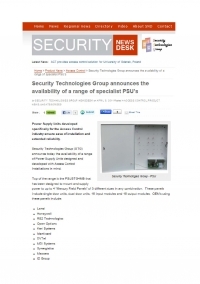 Reprint of article announcing the launch of a range of Specialist Power Supply Units for the Access Control Industry. 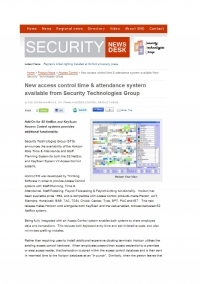 Reprint of article announcing the launch of our Staff Planning and Time & Attendance solution. Reprint of an article anouncing the addition of a Time & Attendance solution and specialist range of Power Supply Units to our product portfolio. 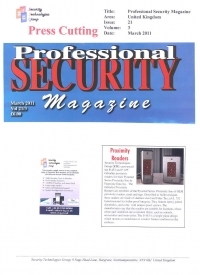 Reprint of article announcing the addition to the range of Bullet Proof readers to our line of proximity solutions. 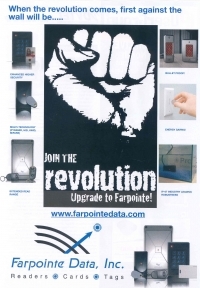 Reprint of an article covering the reduction of carbon footprint using Farpointe Readers in fleaPower™ mode. 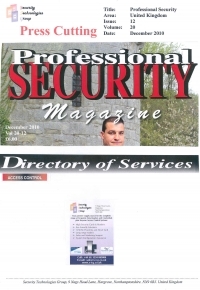 Reprint of a listing run with the Directory of Services section of Professional Security magazine to augment the Farpointe Revolution advertisment. Click on image on the right to download this Press Cutting. 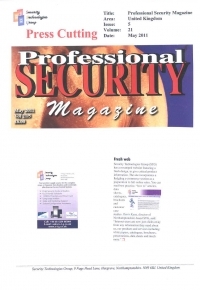 Reprint of a the Farpointe Revolution advertisment run by Professional Security magazine. 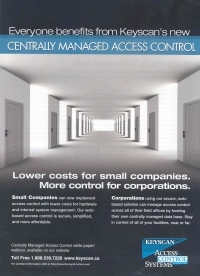 A reprint of a KeyScan advertisment run by Security Management Magazine. 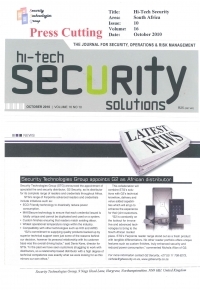 A reprint of an article run by Hi-Tech Magazine of Johannesburg, South Africa announcing the appointment of G2 Security (Pty) Limited as an STG sub distributor. 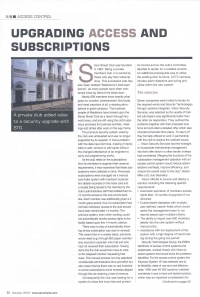 A reprint of an article run by Hi-Tech Magazine of Johannesburg, South Africa outlining the recent security upgrade to a prestigious private members club and how we worked closely with the club and the system integrator to provide advanced functionality. 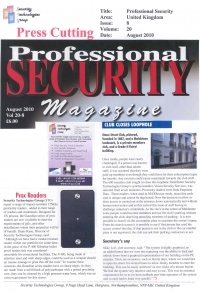 A reprint of a Guardian Reader launch announcement and publication of short form case study (Stone Street Club) run by Professional Security Magazine. 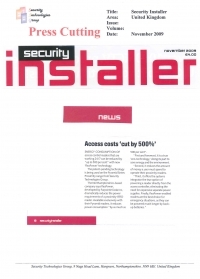 Article reprint from Security Installer Magazine detailing the possible reduction of carbon footprint when using Farpointe readers in fleaPower™ mode. 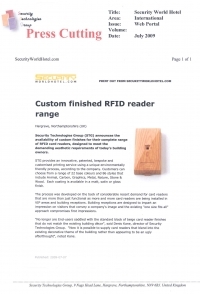 Reprint of an announcement launching custom finishes for our range of RFID Readers. 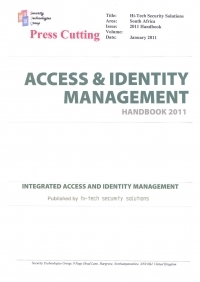 Reprint of an article on the Info4Security web portal announcing the appointment of Security Technologies Group as the EMEA Master Distributor of Farpointe Data's range of RFID Readers and Credentials. 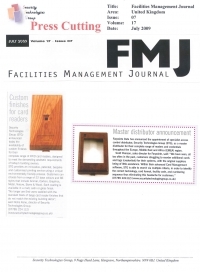 Reprint of an article run in Facilities Management Journal announcing the appointment of Security Technologies Group as the EMEA Master Distributor of Farpointe Data's range of RFID Readers and Credentials plus the availability of Custom Finishes.